A tiny bit of rock gravel falling onto the windshield of a car is how it all starts. The first signs of something bigger to come. 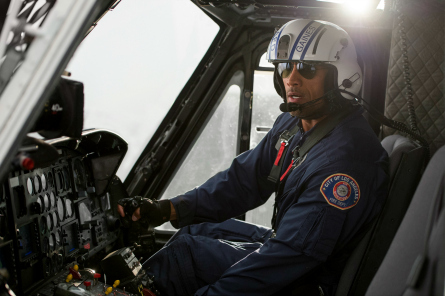 Once enough of the rocks pushes a young female driver off of the road and onto the edge of a cliff, Los Angeles Fire Fighter rescue worker, Ray (Dwayne “The Rock” Johnson) swoops in with his helicopter to remove her from the deadly scene. Just another day on the job where Ray literally makes it his job to rescue people. A great use for the actor’s large muscles. It all snow-balls after that, and from there the tremors quickly build-up along with Ray’s back-story about his daughter, and estranged soon-to-be legally ex-wife Emma (Carla Gugino). The tremors don’t stop. Dwayne Johnson and Carla Gugino join forces again since their teaming together to fight aliens in “Escape to Witch Mountain” movie in 2009. Dwayne Johnson stars as “Ray”. Before the start of the quakes, seismologist Lawrence Hayes (Paul Giamatti) and his team were fiercely working on a system of their own that would accurately predict earthquakes. The system’s success is discovered during tests when the actual quake begins to hit. Good timing for residents of California because Hayes warns to the public through a Cal Poly news feed where he teaches that the tremblings are not “after-shocks” but smaller quakes leading to the biggest earthquake California has seen – one so strong that it will be felt on the East Coast. In an attempt to bond with his daughter Blake (Alexandra Daddario) by taking her to college on a road trip from Los Angeles to San Francisco, his wife’s prominent Architect boyfriend, Daniel Reddick (Ioan Gruffudd) shuts down the plans when he suggests she ride up North with him where he has his architecture work. Back at work where he is much needed, the quakes put Ray in the fortunate position where he can save his wife by using his helicopter. Meanwhile, San Francisco happens to be the last place where someone would want to be during all of this disastrous activity. What are the chances that he and his wife are at one or the major points of the fault line (Los Angeles), and their daughter is at the other one (San Francisco)? Blake gets into a seemingly un-rescuable position inside of a parking garage far away from her dad. Her fortunate encounter with a couple of brothers saves her life, then she continues to save theirs by using her survival skills and knowledge that she picked-up from her dad enough to get her and the brothers through the frightening situations as they await for real help to arrive. 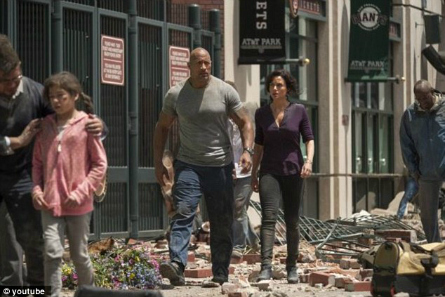 Dwayne Johnson with Carla Gugino as “Emma”. There are many relatable moments in the film such as parents reacting to their children in danger; what if you knew it was the last time you’d see your loved one? Characters in the movie are put to the ultimate test seeing what people are really made of when their lives are in danger and revealing who your real rocks are (no pun intended). Via special effects and 3D glasses, viewers will get to see what the infamous “the big one” of California looks like when it hits in the “San Andreas” movie. Many unforgettable imageries make-up this film, most notably the actual San Andreas fault line splitting wide open, along with out of this world tsunamis, and the Hollywood Sign falling down. There are some real tear-jerker moments in the movie which does a great job of getting the audience emotionally attached to the main characters. It’s quite the visual adventure with about 90 percent of the movie great visual effects and the other 10 percent storyline and plot. The 3D used in “San Andreas” was nearly perfect. It was not over-done and just enough to enhance certain images which is 3D working at its best. The movie is so immersive that the 3D is an added bonus which made me forget it was there enhancing the experience! 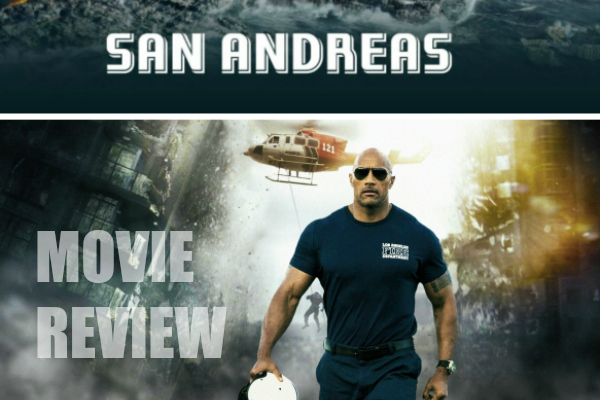 “San Andreas” movie opens in theaters on Friday, May 29, 2015.